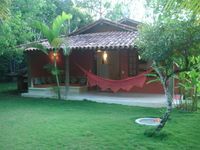 Properties in Porto Seguro average 4.6 out of 5 stars. Property 4: Villa in "Villa Italia Residential"
Property 6: residence in the falesia of Praia da Pitinga. Breathtaking panorama! CHALET MITUCA AND ANNA, 1 QTO 2 BATHROOM. SOSSEGO AND NATURE. Property 11: CHALET MITUCA AND ANNA, 1 QTO 2 BATHROOM. SOSSEGO AND NATURE. Property 13: Chalet for couple, near the beaches and the Square. Property 17: Chalet of the Fountain. A corner of quiet and silence in contact with nature. Comfortable cottages with pool, garden, reading area and close to the beaches. Property 19: Comfortable cottages with pool, garden, reading area and close to the beaches.